Let’s look at the beautiful Benjamin Moore paint color called Sea Haze, pictured in actual rooms. As a Certified True Color Expert, trained by Canadian colour (I add the ‘u’ to the word color because she does) expert Maria Killam, I know that color on the wall can’t be chosen successfully from a tiny paint chip from a fan deck. And, I know that the color on the chip isn’t even paint, it is a printed interpretation of a paint color. That is why I always rely on my large painted samples when helping a client select paint color. And Sea Haze used in a Candace Olson-designed bedroom/bath combination, where you can see some of the various shades which the color Sea Haze can read. My very first kitchen consultation had greeny gray granite countertops as the focal color in the kitchen. The existing beige color on the walls wasn’t doing a thing for the focal color granite in the room. At the initial consultation, I selected Sea Haze with my magic wand fan deck as the probable choice. Once the large sample was painted up and brought over, it was the clear choice. The client and I could immediately see that the granite color simply came alive next to Sea Haze. Remember, Sea Haze is a magic color, and changes beautifully with the light. 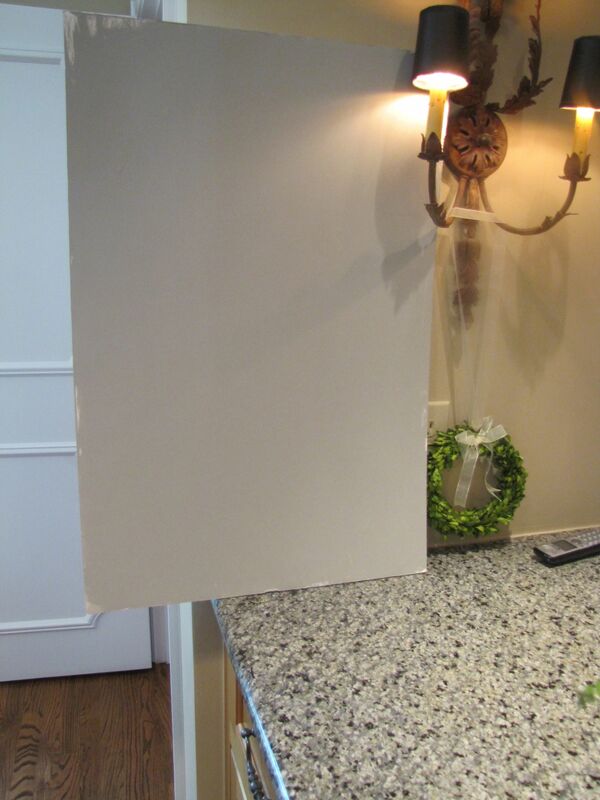 Here is the actual Sea Haze sample I used in the kitchen consultation. Notice how the color of the large sample brings out the rich greeny grays of the existing granite countertop. That is what the right color does in a room. It creates visual harmony. Remember that, because it is one of the most important things that will happen when you paint the right color on your walls. The right color creates visual harmony. Are the paint colors in your home helping you achieve visual harmony? With furniture, between a pricey antique and even a wonderful reproduction, there could be many thousands of dollars’ difference. With paint, it costs exactly the same to paint a wonderful color which gives visual harmony, as it does to paint the wrong color which never will! This entry was posted on March 23, 2012 by Ellen at Color Calling. It was filed under Benjamin Moore colors, Residential styling and was tagged with Maria Killam, Sea Haze.